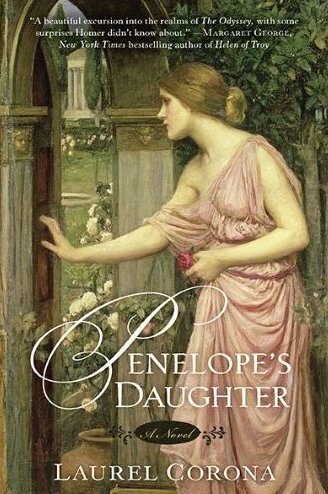 REVIEW: Penelope’s Daughter , written by Laurel Corona, takes Homer’s The Odyssey and flips it on its head…focusing instead on what happened to his wife Penelope, daughter Xanthe and son Telemachus during his absence, as narrated to the readers by Xanthe while she weaves the story of her life on her loom. Most of us know of Homer’s The Odyssey from required reading in school, but I have to admit that I don’t remember very much of the experience. I can say now that if it was as entertaining as Penelope’s Daughter I might have paid a lot more attention! It just took a few pages and I was caught up in Xanthe’s world with Corona’s entrancing style of writing and exquisite descriptions. My most favorite part was how the author began each chapter with Xanthe at the loom describing the colors she would use to represent a person, event or place that had meaning to her. This was my first read by Laurel Corona, but you can be bet I will be back for more! Penelope’s Daughter was one phenomenal book and I highly recommend it! MORE LAUREL CORONA IN APRIL 2011…. Looks like we won’t have too long to wait for another novel by Laurel Corona…Finding Emilie is due out on April 12, 2011!! It sounds really good, so I’m super excited about it! SYNOPSIS (via laurelcorona.com): Stanislas-Adélaïde du Châtelet, known as Lili, is a thoughtful and serious girl growing up as the ward of a Parisian noblewoman, Julie de Bercy. Madame de Bercy, a friend of Lili's dead mother, the brilliant and controversial scientist Emilie du Chatelet, has a daughter, Delphine, the same age as Lili. Though they could hardly be more different, the two girls grow up as sisters, steadfast friends, and confidantes. FTC DISCLOSURE: This book was graciously sent to me by the author and I am very thankful for the opportunity. I really enjoyed the Odyssey and loved Penelope's Daughter. I have her The Four Seasons that I hope to read soon and can't wait for Finding Emilie. I can't wait to start this book! It arrived the other day... yippee :) Glad you enjoyed it so much. Have a great weekend! Amy, this sounds great. I can't wait to read it! Both books sound like they will be interesting reads. It makes the story more rounded to present it from a different perspective. I look forward to reading it. Thanks to everyone for your support. I hope you LOVE the book! This looks like a new author I'm going to become addicted to!! Thank you for your review. I enjoyed reading it. I want to read the book more than ever. When I read about weaving for some reason I think of Rapunzel. I should think of Rumpelstiltzken, right? Oh boy, I've forgotten how to spell Mr. Rump's name. Your review makes the book seem like a beautiful romance. Great, great review. This sounds great! I'll definitely have to check it out.